In a year when the electorate is embracing angry old white men, discovering that a dead white man who was best known for his roles in horror movies was not only a serious gourmet cook, but coauthored a popular cookbook with his wife might barely register a shrug. The book is A Treasury of Great Recipes and the authors are Mary and Vincent Price—yes, that Vincent Price. Out of print for many years, this much-loved cookbook from a bygone era was recently rereleased in a 50th anniversary edition. This is a book of restaurant recipes adapted for the home cook that were collected by the Prices as they traveled around Europe, the United States, and Mexico. It is a fascinating time capsule that chronicles what the affluent were eating during their travels back in the 1960s. In many ways, it is an early template for the currently popular PBS series I’ll Have What Phil’s Having. Except that whereas Phil Rosenthal assumes that you too will be able to have a meal in any of the restaurants he visits during his travels, the Prices write about their experiences from a decidedly more privileged perch. Back in the ’60s few Americans could afford to eat out frequently let alone travel abroad, so there is a whiff of noblesse oblige coming from the pages of A Treasury whose title might just as well have been You Can’t Have What Vincent’s Having, But Here’s the Recipe for It. 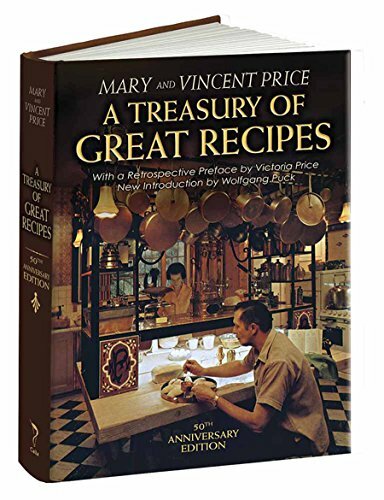 Before digging into the recipes themselves, it is well worth reading the preface to this anniversary edition written by their daughter, Victoria Price. First, it forms the basis for the philosophy behind the book: both Mary and Vincent Price were born of privilege and shared a lifelong belief that the arts—both culinary and visual—were not “the province of the elite.” Their aim was to encourage everyone to lead a life filled with art, beauty, and good food. As much an homage to her famous father as it is a swipe at her mother, the preface is a compelling read for reasons that have nothing to do with recipes for the good life. In it, Ms. Price devotes some time to describing her life as the only child who came late in the marriage of her larger-than-life father and demanding, artistic mother who worked as a costume designer. Much to the disappointment of her parents—and most particularly her mother—Victoria was a picky eater whose food aversions were the source of marital discord that often led to mealtime arguments. Let’s just say that cooking may not be the only armchair indulgence prompted by A Treasury of Great Recipes. Of course like many restaurant cookbooks, the recipes themselves are more aspirational than practical to recreate at home. Heavy on cream, sauces and—in the case of France—truffles, many are multi-step recipes for people with time on their hands. Still, there are some that are quicker and absolutely doable for most home cooks. Yes, it is a luxury to buy fresh crabmeat, but this is a splurge that is worth it if you are willing to experiment with some additional herbs. The taste of this hot crab dish while very good felt a little timid in the sense that it needed some extra oomph like a sprinkling of fresh tarragon or other strong herb. Timid is the way many of these recipes seem. (Were our palates so much more bland back then?) The Breast of Chicken au Champagne from the Whitehall Inn in Chicago (now a boutique hotel with two restaurants) was also a bit bland. The cream makes it luxurious but doesn’t add flavor and just ¼ cup of Champagne at the end doesn’t quite give it the boost that it needs. For inexperienced cooks, the recipes are short on explanations and sometimes too long on recommended cooking times (an hour for a one-pound strip of pork tenderloin under the broiler?). Treat the recipes more like foundations on which to build your own creations, and you’ll be fine. But whether you make any of the recipes or not, the real joy of A Treasury of Great Recipes is the way it transports you to another world. What must it have been like for someone 50 years ago to read about all those wonderful meals and recipes at famous restaurants knowing they would probably never eat at any of them? Today it feels like nostalgia, back then it must have felt like fiction. Either way, a bit of escapism is just what the doctor ordered.